by Ivana Horbec · 24. April 2017. Dr. Ivana Horbec participated at the conference with a presentation titled Lessons in ‘Good Policy’ for the King’s Servant: Political and Cameral Studies in Croatia 1769-1776. 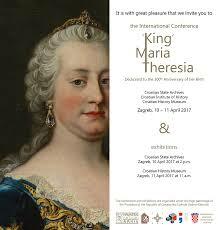 Parallel with extensive reforms which led to the formation of proto-modern government in Croatian-Slavonian Kingdom during the reign of Maria Theresa, new type of civil servant was introduced. Still predominantly from a noble background, he was receptive to reforms and loyal to the interests of the Viennese Court and, above all, competent to advise the King on necessary improvements in accordance with the enlightened government, while being accepted by the estates as traditional political structures. Accordingly, the professional education of civil servants became one of the major goals of 18th-century educational reforms, and a range of state-controlled academies and university courses were established by Maria Theresa. Lectures on sciences serving state and political economy were given on these higher schools in order to teach prospective civil servants the art of ‘good policy’ (gute Polizei), or wise governance, which comprised theoretical knowledge of public administration, education, health, economy, security etc. as main postulates for incorporating common good and prosperity. One of these courses, the Course of Political and Cameral Studies (Studium politico-camerale) was established 1769 in Varaždin in Croatia. It was closely linked to the newly formed Croatian government and aimed to serve as a regional educational centre not only for prospective civil servants, but also for officials already in service. Focusing on the Course in Varaždin as an example of regionally recognized institution of higher learning in the period of the formation of state-controlled education system, this paper aims to analyse the educational policy of Maria Theresa towards her civil servants and to identify the knowledge required for public service during enlightened absolutism. The Course in Varaždin will be compared with similar courses in Austria and Hungary. Also, its success in Croatia, where it was supposed to function as the key institution for educational strategies of local noblemen, will be questioned.